A funny rolling wooden whale. 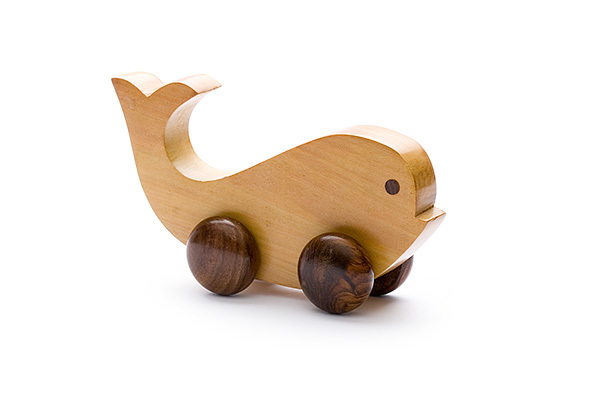 This wooden whale is an attractive wooden toy for children as of the age of 1 year. The design of the whale is deliberately kept simple to stimulate the fantasy world of your child. The wooden whale can move on its four wheels, is hand made and produced out of sustainable natural wood. This wooden whale is not only fun to play with but also stimulates the development of the gross and fine motor skills of your child and above all, its fantasy world. The whale suits also perfectly as decoration for your child's room. Each wooden whale is individually branded by the natural grains of the wood and the touch of the craftsman.